Tickets $30/$20(conc) available through BASS 131 246 (service fees apply), or at the door. State of being adjusted to a certain wave length; agreement or tuning between an apparatus emitting oscillations and that of a receiver. 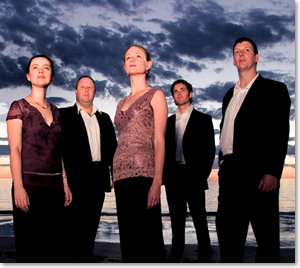 Syntony, Adelaide’s acclaimed vocal ensemble, is recognised for its outstanding crystalline sound and a dynamic blend of musical interpretation and ideas. It explores the essence of vocal music and its relationship between composer, performer and audience. Syntony programs music from a broad variety of genres including Medieval, Renaissance, Baroque and Contemporary Australian, presented in innovative concerts with evocative coherent themes. Syntony has consistently received critical acclaim for its concert series since 2002 and has performed on invitation at the Adelaide, Barossa and Coriole festivals. Syntony has been recorded and broadcast by ABC classic FM and released its debut self–titled CD in 2007.